White Ford, manufactured in 2018, first registered on 1 September 2018. Cylinder capacity: 1995cc, CO2 emissions: 167 g/km. 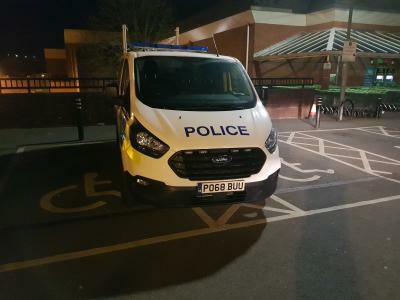 I have a few friends who are police officers they do this as they can’t piss about when pulling out if they are called to an emergency so they have to park between two spaces so they can tale off it they are called out to an emergency. All emergency services cars/vans/engines are permitted to do this. They may of been attending a call out in tescos, you dumb cunts! Ok, He must be blind and if he can drive then why is he in the disabled? I guess when you're called to an emergency, then do you really care about where you park, more of a case of getting to the emergency without wasting time lining up the vehicle in a space. Their Krispy kreme donuts are probably more of a concern on their mind, than parking properly.